When it is not possible to ascertain the increase in resistance due to the roughness of the two surfaces to beconnected, the connector plays an even more important role. A slipping movement between the structural element components reduces the overall load bearing capacity and increases the deformation. 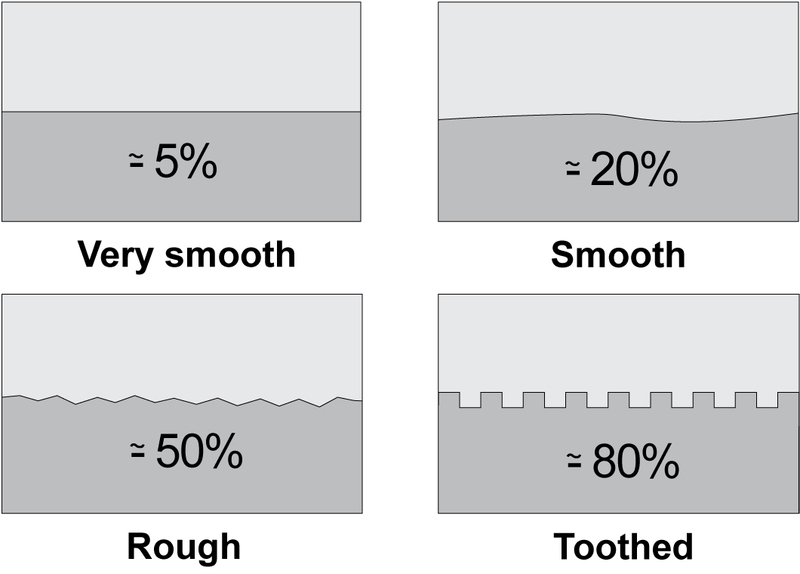 A) Very smooth: if cast on smooth formwork. B) Smooth: in case of simple vibrated surface cap. This is the most frequent case. C) Rough: roughness obtained artificially using mechanical means. D) Toothed: appropriately prepared and cast using purposely shaped elements. In the case of exposed hollow bricks or hollow bricks covered by a very thin layer of mortar, for the purpose of safety contribution must be considered as equal to zero. In addition, the resistance and deformation properties of the connection have an impact on the operation of the composite element. In particular, the ductility of the connection becomes an important characteristic, as, on one hand, it makes it possible to obtain the maximum composite structure bending load bearing capacity before breaking due to failure of the connection, and, on the other hand, impacts on the design criteria, because the distribution of the shearing action allowed by the connection provides an even distribution of the connectors along the structural elements. These considerations demonstrate how, in slab reinforcement, the knowledge of the performance characteristics of the connection is of fundamental importance for a correct design, and for the assessment of the reliability of the intervention for the static adaptation of the floor through the addition of a superimposing slab. To facilitate installation, the connection normally consists of stud connectors, the anchoring of which to the elements being connected may vary depending on the material.